Bail allows people who have been arrested to remain out of jail while waiting for trial. It can be paid by friends, relatives or the person accused of a crime. In fact, anyone can bail another person out of jail. Many people who are not willing or able to come up with bail money on their own seek the services of bail bondsmen, who post (pay) bail for a fee. The bail bond fee is usually about 10 percent of the total bail amount, although the fee can vary depending on the circumstances. A bail bondsman can help you understand your rights and can assist you with the bail process. During the arrest process, the police are required to read the legal rights of the accused aloud; these are known as Miranda rights. Once arrested, the accused is taken to a jail facility and "booked," which is essentially an administrative procedure. Bail is a right protected by the U.S. Constitution. It is a "surety bond" (usually in the form of cash) that the court holds to ensure that the person accused of a crime shows up for required court appearances. Most people who are arrested have the opportunity to "post bail." Posting bail allows the accused to remain free until trial. To decide if the accused will be allowed to post bail  and how much the bail will be  there may be a bail hearing after the arrest and booking processes have taken place. The bail process usually begins within 48 hours; however, in some circumstances, and usually with the assistance of a professional bail bondsman, it can begin in as little as one hour. If the crime is relatively minor, or if the judge believes that the accused is unlikely to flee, he may be released "on his own recognizance." In this case, no bail is required. The purpose of a bail hearing is to decide whether the defendant should be released from custody prior to trial, not to argue the facts of the case itself. At the hearing, the judge will consider a variety of bail factors, including the nature of the crime(s) and the defendant's character, criminal history, financial resources and community ties. At a bail hearing, the defendant's attorney may also present character reference letters, employment agreements, school records and other evidence that demonstrates the defendant's good character and strong community ties. If you or a loved one is in custody, skilled representation could make the difference between pre-trial detention and pre-trial release. If cash or a bond is required, the defendant will be released after bail is posted. 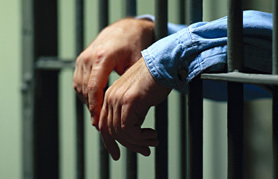 If the defendant cannot afford bail, an attorney can help arrange for a bail bondsman to post bail for the defendant. To learn more about posting bail, speak to a bail attorney. Courts take several considerations into account when deciding how much bail the accused must pay to get out of jail. For common crimes, many courts use a "bail schedule." Bail schedules consist of a list of crimes and the amount of bail that must be posted for those crimes. While they are widely used for more common crimes, bail schedules do not cover all offenses; when a person is accused of a crime not covered by the court's bail schedule, the judge will determine the bail amount that must be paid. The origins of current U.S. bail law can be traced to 17th Century English law. The Habeas Corpus Act of 1679 required that authorities release prisoners "with one or more Surety or Sureties" (money or something else of value). Ten years later, the English Bill of Rights required courts to make bail fair and affordable. The Eighth Amendment to the United States Constitution, which also protects defendants from excessive bail, was based on this English law. The amount of bail money held by the court depends on a number of factors, including the severity of the crime, prior convictions and the potential risk of flight. If the accused appears at the required court hearings, the court refunds the money to the person or company who provided the bail. If the accused does not appear, the court keeps the money. Once bail has been paid, the accused is free to go but must appear at the next scheduled court appearance. When the accused appears in court at the scheduled time, the bail that was paid is refunded to whoever paid it. In cases where the bail is posted by a bail bondsman, the bail is returned to the bail bondsman who then returns the collateral to the accused, minus the fee that the accused was charged by the bail bondsman to supply the bail bond. However, if the accused fails to appear in court, a warrant is issued for his or her arrest, and the court keeps the money; in addition, the accused forfeits whatever collateral he or she provided to secure the bail bond. Is bail the same in every state? No. Bail varies from state to state and even county to county in some cases. To determine the bail procedures in your county or state, you may want to contact a bail bondsman in your area. In some cases, the judge decides how much bail the accused must pay. However, with common crimes, many courts use a bail schedule. How soon can I get out? You will be released from jail as soon as your bail is paid. Can I pay bail by myself (without a bail bondsman)? Yes, bail can be paid without using a bail bond, in which case the bail money is returned when the accused appears in court at the scheduled time. If the accused cannot or does not wish to pay the bail amount with his own funds, he may secure a bail bond, which typically includes a non-refundable fee of about 10 percent; this fee varies from bail bondsman to bail bondsman. Except in cases where bail is determined according to a set schedule, bail is at the discretion of the judge. However, the Eighth Amendment forbids the court from assessing "excessive bail." To learn more about your rights and the bail process, contact a bail bondsman in your area today. In the United States, bail may be set for relatively minor arrests (DUI arrests, drug arrests) as well as for more serious crimes.